Santa Baby….just put the sable under the tree, for me….I mean, the MetroShip houseboat under the tree! For 2010, the “His and Hers” gift is a floating romantic getaway aboard a 48 Foot Luxury MetroShip houseboat in New York. The living area includes a Sony LCD flat-screen TV, a Nintendo Wii, Viking appliances and a remote-controlled media center. The bathroom features a Kohler frameless shower and the master suite bedroom features a luxury W Hotel bed. The entire boat features hardwood floors and maintenance-free translucent thermal aluminum walls. 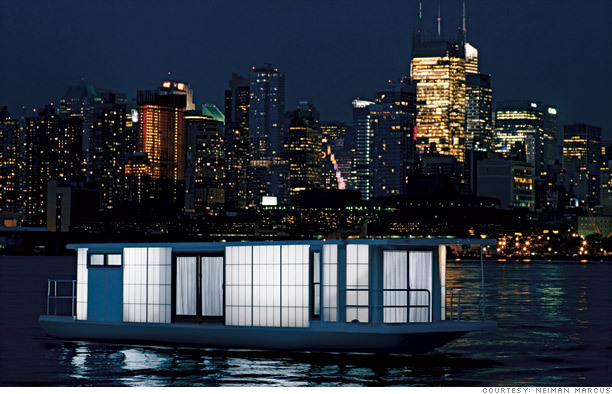 You can travel anywhere on this houseboat for the mere price of $250,000. What would you wish for in the Christmas book?